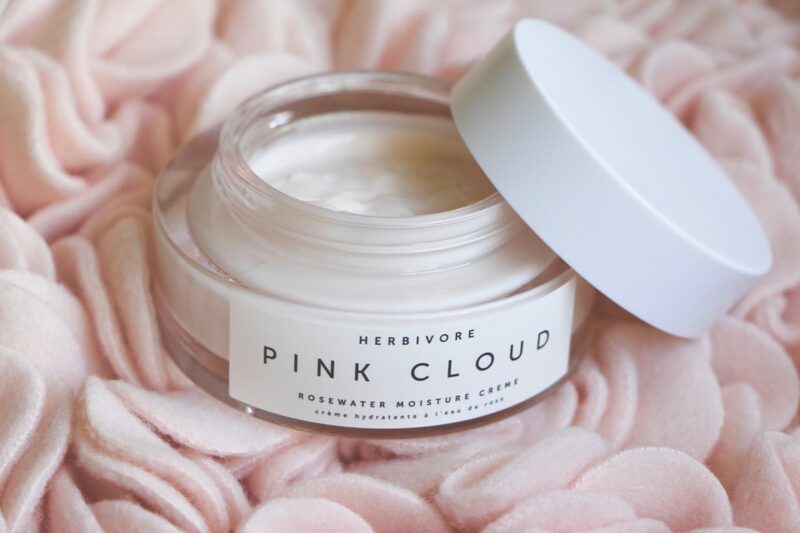 As I scrape the very last remnants of cream from the bottom of the glass jar, I find myself missing Herbivore’s Pink Cloud Rosewater Moisture Cream before it has even reached the recycling box. Unusual for me, because quite a lot of the time I’m in a rush to try the next new product. Very few creams and balms and potions get an emotional reaction – though it has to be said that it’s the cleverly-scented things, usually with an aromatherapy lean, that tend to get subconsciously bumped up the list. Results-driven skincare products – the acids and the retinols and the peptide serums and the sticky, grainy Vitamin C pastes – don’t tend to smell spa-like, or mind-transporting, or even that pleasant. They often smells of raw meat or of cat wee. And although I get very attached to these items, because they’re effective and give visible results, I don’t have the same happy feeling when I apply them. I’ve spoken about this before; the feeling of utter joy that I get when I take the time to apply certain things to face and body. Darphin’s Aromatic Cleansing Balm, Aurelia’s Dry Oil, Aromatherapy Associates Bath & Shower Oil, Omorovicza’s Queen of Hungary Mist. There’s a bigger list, but not that much bigger – it takes a lot for a product to really make me stop and take notice. 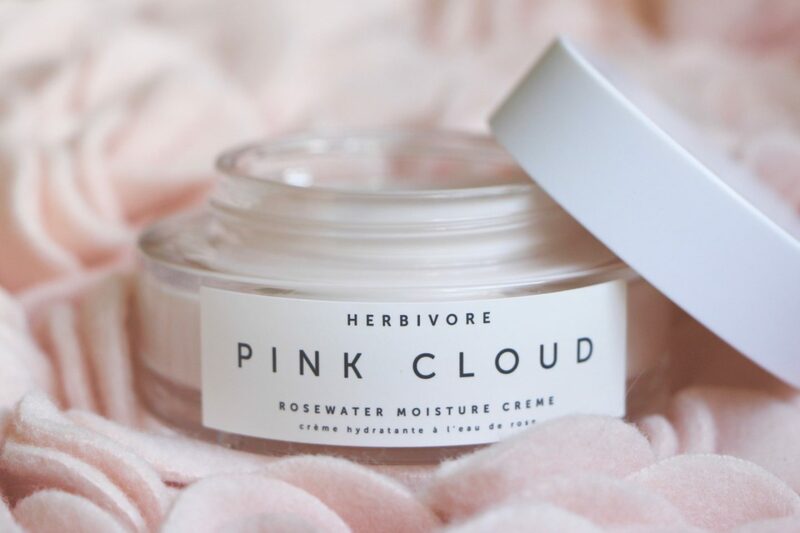 So it’s worth noting that the Herbivore Pink Cloud Rosewater Moisture Cream* is the latest addition to my relatively brief and picky list. I started using this cream in the middle of the hot, clammy summer and it proved itself the perfect cooling companion. Beautifully light, delicately scented, it felt almost completely weightless at the same time as being an effective top-coat moisturiser for my stressed, dry-ish skin. It’s a clever bit of marketing, the Pink Cloud thing. Could a product name be any more millennial? I’m older than the allowable cut-off point for millennials (boo hoo) but it certainly works on me too. I remember a cream by Amanda Lacey called Pink Cream and when I had a little pot of it in a British Airways flight kit I slathered the whole thing over my face, chest, arms and feet. Delightful. I’m also repeatedly drawn to ESPA’s Pink Hair and Scalp Mud*, likely for the same reason. The word Pink. Which probably makes me very shallow, but so be it. I also bought a bath mat that looks like petals* and I won’t let anyone stand on it in case their feet are dirty; choosing creams because they’re pink is the least of my problems. Anyway, returning to the delight that is the Herbivore Rosewater Moisture Cream. No excess grease, no stickiness, just a soothing, cooling formula that sits beautifully beneath makeup. I get on well with delicate rose creams (MV Organic Skincare‘s is one of my all-time favourites) but I must admit that I usually have to layer them over a serum – either a hyaluronic one (currently Guerlain or Institut Esthederm*) or last thing at night on top of my glycolic or retinol treatment (at the moment it’s Skinceuticals Glycolic 10* and Medik8 Crystal Retinal 6). On its own, the Pink Cloud doesn’t quite do enough for my normal-dry skin. But as a top coat? Just absolutely lush. 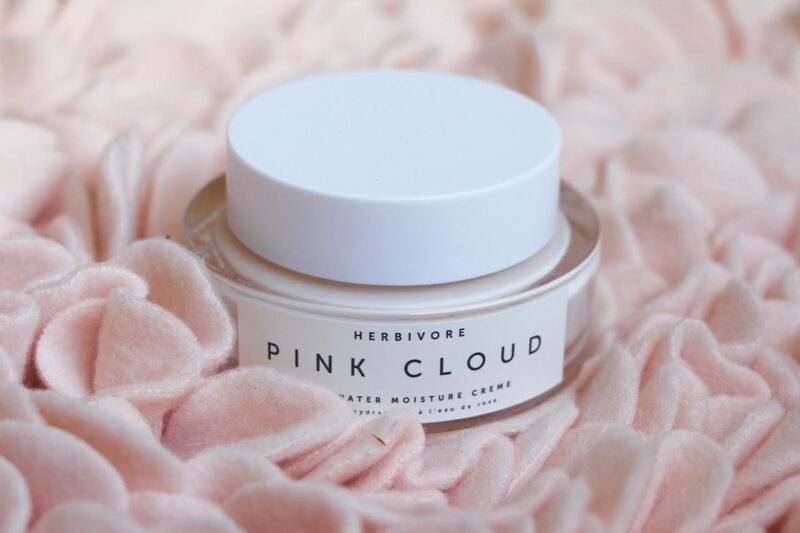 I’m going to go in a big circle and come back to the start of my post, when I mentioned products that I have a weird emotional connection to, usually because of the smell: Herbivore’s Pink Cloud is the softest, cleanest sort of rose. Not overpowering, not the sort of rose that smells as though it’s been knocked up in someone’s allotment shed, not that awful synthetic rose smell; just light and refreshing and chic. This cream is for everyone, really, so long as they like rose; perhaps it won’t cut it for the driest of skins, but for those who want lightweight hydration and a luxury treat, it’s perfect. It melts down to almost nothing on application – cool and watery – but has that pleasing buttery texture when you scoop from the jar. If you tend to use a hydrating gel or jelly for its no-grease finish, but always mourn the lack of creaminess, the sense of comfort, the softness and blanket of nourishment that you only really get with a cream, then this could be the sort of thing you’re looking for. Equally, if it’s a sweet-smelling top coat you want, something to seal in the goods (whether its your acid, your retinol or a hyaluronic serum) you’ll find yourself reaching for this again and again. 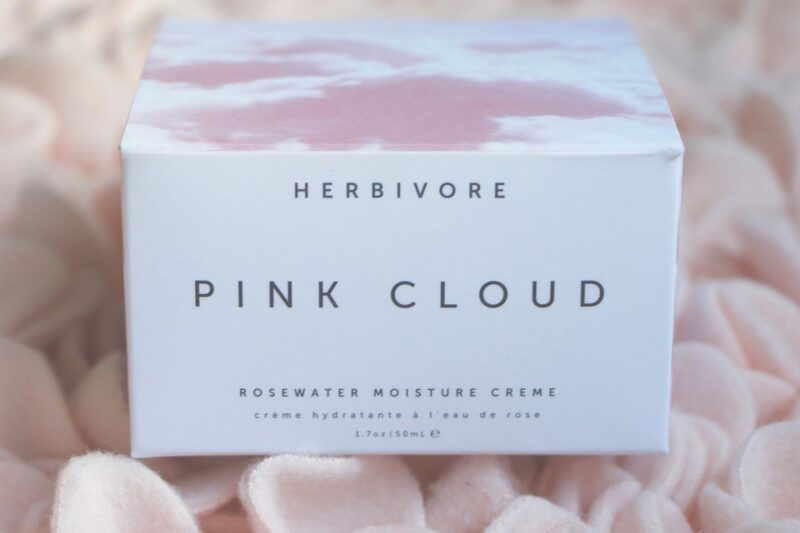 Herbivore Pink Cloud Rosewater Moisture Cream is £42 at Space NK* – note that this does not contain sunscreen, so when I say “top coat” I refer to last thing at night or, if it’s daytime, before SPF if needed. This is such a beautiful product. I always wanted to try it. Want to try this cream as it looks so good and good for my dry skin! Also it is photographed so nicely. I am not into pink nor into rose scent, yet the texture of the cream intrigues me. I am going to have to try this out because I am loving this brand at the moment! I get so much joy from the fact that you photographed the cream on top of said bath mat. Ruth Crilly, you are brilliant. And agreed that you shouldn’t let anyone step on it. It’s just too nice. I mean, even if they’ve been in the bath and they have clean feet; I’m not sure I want to get it wet. Sounds lovely, if you enjoy pink things *cough* try the new Elemis Frangipani Monoi hair and scalp mask whippy pink clay that smells like the Pacific. Yum! Stop! Don’t tempt me with more!